According to recent reports, users are having trouble with the Windows 10 cumulative update KB3189866 as it won’t install and gets stuck in the middle on Windows Update tool. Here’s how to manually install Windows update guide which you can use to fix Windows update stuck error. You can use steps in this guide to manually install any Windows 10 update, but here, to illustrate as an example we are going to focus on KB3189866 Windows 10 cumulative update. 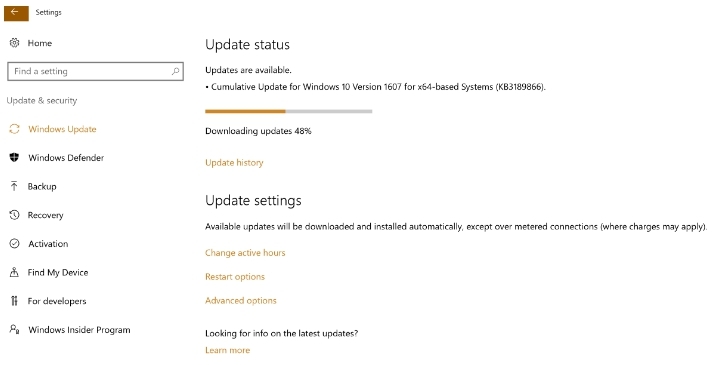 Users who are reporting problem with KB3189866 cumulative update say that it gets stuck at around 45% or 95% mark when you try to install it from Windows Update tool on Windows 10. No matter what you try, it remains stuck and won’t move forward. If you are facing Windows update problem, first thing you should do is to restart the PC and try installing the update again or run Windows Troubleshooter to find out what’s causing the issue. You could also try resetting Windows update settings or clear the update cache. But if these usual solutions don’t work in KB3189866 case then what you can do is to manually install update on Windows. Some users are saying that you have to wait for around 30 minutes for KB3189866 to resume downloading from servers after getting stuck, while others say it just remains stuck. You can fix Windows update problem by manually installing update without using Windows Update tool on PC. 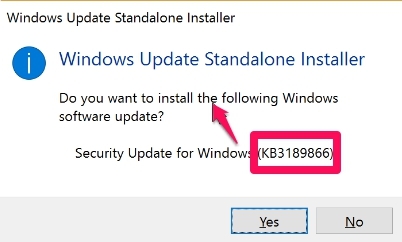 You can apply steps below for installing any Windows update manually, as an illustration, we are going to use KB3189866 update with which most users are having problem downloading as it gets stuck when installing from Windows Update tool. 2 – Make sure to download the right version of the update for your Windows OS. 3 – Run the update file and wait for the installation to complete. 4 – After the installation, restart your PC to apply changes. This should fix Windows update stuck issue. Above example showed how to manually install Windows update if it gets stuck or won’t install through usual Windows update tool on PC. Now you must be wondering how to get Windows update download links for other update that Microsoft release regularly. For that, you need to go to the Microsoft catalog website to download direct links for Windows updates. Click on the link above, type the KB string in the search and wait for the result list to show up on the screen. From the list you can select download link for any update you wish to download on your PC. But there is one little inconvenience that you may face with this method as Microsoft Update Catalog website is based on ActiveX which is supported by only Internet Explorer browser. But see this trick to get around this restriction and access the download link site on any web browser.